There are still many providers that waste valuable time using antiquated patient contact methods for routine reminders and engagement processes. Our new workflow solutions streamline these tasks, allowing healthcare providers to focus their time on what's most important. 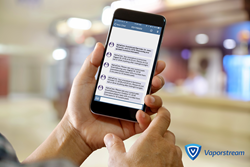 Vaporstream, the leading provider of secure, ephemeral and compliant messaging, today announced the addition of automated healthcare workflows to its award-winning communications solution, empowering providers with the industry's first HIPAA-compliant secure messaging platform with automated patient care communications. The Vaporstream platform automates routine communications such as the appointment reminder process for clinical care teams, as well as secure communications like pre- and post-surgical engagement, educational and motivational workflows, and discharge procedures that require details about the patient's care, medications and more. With the new workflows, Vaporstream's healthcare customers can now also automate and secure communications among specific patient populations, such as those with heart disease, cancer, type 2 diabetes, obesity, arthritis and many other chronic conditions. "Although many healthcare organizations have incorporated secure messaging capabilities to streamline clinical communications, there are still many providers that waste valuable time using antiquated patient contact methods for routine reminders and engagement processes," said Galina Datskovksy, CEO of Vaporstream. "Our new workflow solutions streamline these tasks, allowing healthcare providers to focus their time on what's most important - providing excellent patient care." No-shows for scheduled appointments and surgical procedures, as well the impacts of medication nonadherence, are more than just inconveniences; they are major sources of lost revenue for the healthcare system. With the cost of missed appointments reaching $150 billion and the estimated cost of medication nonadherence ranging between $100-289 billion annually in the United States, many healthcare providers have adopted phone call-based reminder processes to help patients comply with appointment schedules and prescribed treatment plans, such as those that require patients to stop eating and taking medications at a certain time before surgeries. Unfortunately, however, these processes require organizational personnel to spend about 25 percent of their workday on routine follow-up communications. By automating patient communications, programs and reminders, patients are more likely to comply with their treatment plans and appointments, and care providers can instead focus on billable patient care activities to increase productivity and revenue. As with all Vaporstream messages, the new workflow solution communications are secure, ephemeral and can be archived to a repository of record of the care provider's choice for HIPAA compliance purposes. For a demo of the Vaporstream Secure Communications Platform at HIMSS 2018, visit Vaporstream at the Cybersecurity Command Center Booth #8500, Kiosk 27 from March 5-9 in Las Vegas, or visit http://go.vaporstream.com/himss18 to schedule a meeting.